The theme for National Work Zone Awareness Week this year is “Safety Is in Your Hands.” If you’re wondering why this message specifically targets the public and not measures to make work zones safer for construction workers, look no further than one key statistic. Of the more than 600 deaths that occur in work zones every year, over 97 percent of them are to the traveling public. Five seconds is the average time a driver’s eyes are off the road while texting. At 55 miles per hour, that’s like traveling the length of a football field blindfolded. As a longtime member of the American Road & Transportation Builders Association (ARTBA) Work Zone Safety Consortium, the LHSFNA has continued to help raise awareness about the importance of work zone safety. The practices that keep workers safe inside work zones are well-known, but the greatest risk to workers is from the traveling public. These risks are much more difficult for contractors to control or legislators to regulate. Distracted driving can be a major factor. Drivers can be impaired (e.g., drunk, under the influence of drugs), drowsy, distracted by a cell phone or fellow passengers or simply driving too fast to stop in time. Alcohol was a factor in 25 percent of fatal work zones crashes in 2014 and speed was a factor 28 percent of the time. Research from the National Safety Council shows that even hands-free devices cause distractions and lower driver awareness. The National Safety Council’s Road to Zero campaign aims to eliminate all traffic fatalities within 30 years. That may seem like an impossible goal to some, but it’s a goal worth striving for, and one that the construction industry is getting closer to achieving. That’s why the LHSFNA encourages state DOTs and other procurement entities to shift towards best value contracting instead of relying on the low-bid process. This levels the playing field for good actors and increases safety for everyone on the road, including workers, drivers, cyclists and pedestrians. Fatalities in highway work zones have been on the rise since 2010 and that trend is being matched by driving deaths in general. In 2015, driving deaths increased more year-over-year than any time in the last 50 years. Preliminary numbers for 2016 estimate driving fatalities were even higher, topping 40,000 for the first time since 2007. Some of this increase could be caused by lower gas prices making it easier for people to drive more frequently. Another culprit could be more widespread distracted driving. Even though smartphones have been common for years, the number of people who own one in the U.S. was still growing as of 2014. Regardless of the reason, the time to raise awareness about work zone safety is now. With Congress expected to pass a trillion dollar infrastructure funding bill in the near future, more LIUNA members will likely soon be hard at work repairing this country’s outdated and crumbling roads, bridges and water systems. Safety needs to be paramount in this bill. Helping raise driver awareness about slowing down and staying alert when in work zones is a critical part of keeping Laborers safe during flagging and other work zone operations. 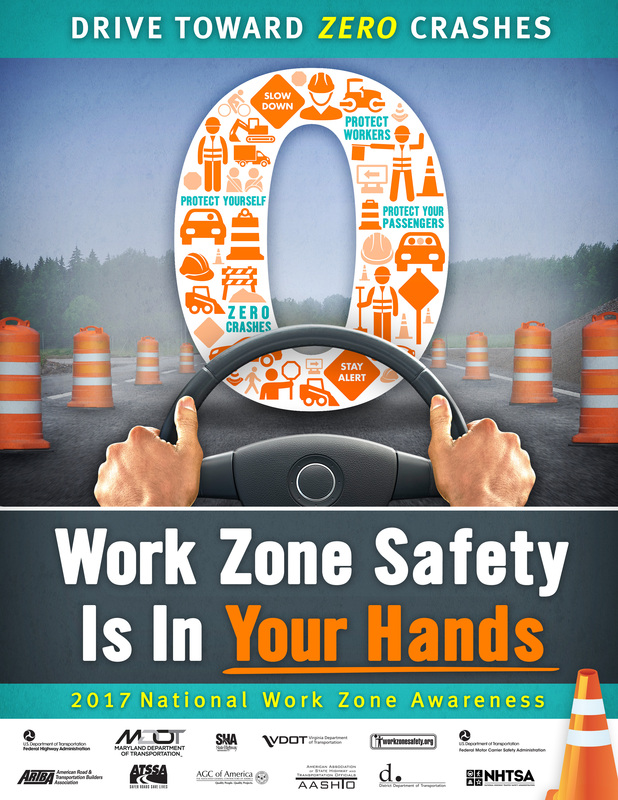 To see how you can participate in National Work Zone Awareness Week, see www.workzonesafety.org or the American Traffic Services Organization’s website. Even though the driving public is the main focus of this year’s campaign, the construction side of a work zone can still present many hazards that workers must be aware of and trained to avoid. The most common of these is workers being struck by a vehicle backing up, which is why the LHSFNA places a priority on spotter training and having every vehicle on site equipped with a functioning backup alarm. The LHSFNA’s Highway Work Zone Safety Checklist pocket guide and Internal Traffic Control Plan pamphlet outline the proper way to set up different types of work zones to keep workers safe. Our Backing Safely, Spotter Safety and Traffic Hazards in Highway Work Zones health alerts can be used as toolbox talks to educate workers about hazards and how to avoid them. Lastly, our Positive Protection brochure and Barriers, Not Barrels poster send the message that protective barriers are one of the best ways to prevent work zone intrusions. To order these or other publications, use the online Publications Catalogue. For more assistance with work zone safety on your site, call the Fund’s OSH Division at 202-628-5465.